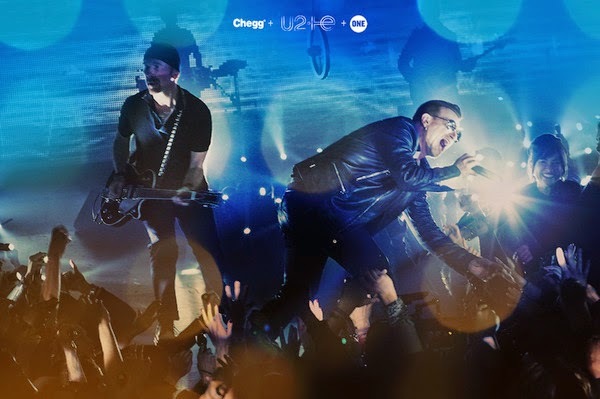 Chegg, the Student Hub, is partnering with the One Campaign on a contest for college students to see the band up close on the iNNOCENCE & eXPERIENCE Tour. Roxanne Philson at ONE, the advocacy group co-founded by Bono to help end extreme poverty, says the collaboration with Chegg and U2 is a great way to engage millenials with smart policies that save lives. 'We need to engage young adults in policy and advocacy. They are our future leaders.' ONE also runs campus programmes at colleges and universities across the US. Winning students will be selected at random following the close of the contest, and the winner’s guest must also be a registered college student. Entries are open today through May 15th, 2015 at 11:59PM PST.